NYC, 04/17/2019, 12:20PM. Bach at Noon. Johann Sebastian Bach was a German composer and musician of the Baroque period. He is known for instrumental compositions such as the Brandenburg Concertos and the Goldberg Variations as well as for vocal music such as the St. Matthew Passion and the Mass in B minor. 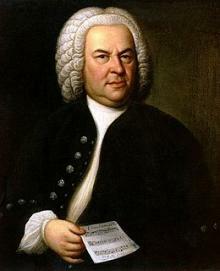 Since the 19th-century Bach has been generally regarded as one of the greatest composers of all time. "The term ‘baroque’ has been widely used since the 19th century to describe the period in Western European art music from about 1600 to 1750... Many famous composers from the first part of the baroque period came from Italy and have a link with Venice, including Claudio Monteverdi and Antonio Vivaldi. Monteverdi was born in Cremona, but moved to Venice where he was ‘maestro di capella’ at the San Marco basilica. Vivaldi was born in Venice and was one of the greatest baroque composers.